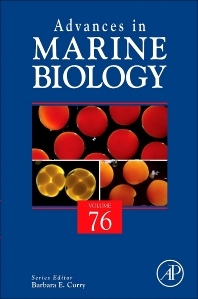 Advances in Marine Biology, Volume 76, the latest release in a series that has been providing in-depth and up-to-date reviews on all aspects of marine biology since 1963 is well known for its contents and editing. This latest addition to the series includes updates on many topics that will appeal to postgraduates and researchers in marine biology, fisheries science, ecology, zoology, and biological oceanography. Specialty areas for the series include marine science, both applied and basic, a wide range of topical areas from all areas of marine ecology, oceanography, fisheries management, and molecular biology, and the full range of geographic areas from polar seas to tropical coral reefs. Barbara E. Curry is a Senior Research Scientist in the Physiological Ecology and Bioenergetics Laboratory of University of Central Florida’s Conservation Biology Program. Her research interests include stress and reproductive physiology, energetics, assimilation efficiency and nutritional ecology, with applications to ecosystem-based population management and conservation. She holds a PhD in the Biological Sciences from Texas A&M University, an MSc in Marine Science from Moss Landing Marine Laboratories, and a BA from University of California, Santa Cruz. Her doctoral research was fully funded by the United States National Oceanic and Atmospheric Administration (NOAA), and focused on phylogenetic relationships among bottlenose dolphins, genus Tursiops, worldwide. Curry was a National Research Council Post-Doctoral Fellow at the NOAA Fisheries Southwest Fisheries Science Center in La Jolla, California. Working as a NOAA scientist for nearly ten years, she conducted a wide range of research projects including studies of marine mammal molecular genetics and of the physiological effects of stress in mammals. She has extensive laboratory experience including in molecular genetics, radioimmunoassay, histology and physiology. Field experience includes marine mammal stranding, recovery and necropsy, and abundance surveys in areas such as the Amazon River (Peru, Ecuador, and Columbia) and the Gulf of Mexico. She has taught a range of courses in the subjects of biology, physiology, anatomy, and vertebrate natural history. Curry has also served as a Mentor for the Harvey Mudd College Upward Bound Math and Science Program, and as a Lecturer for the National Science Foundation Young Scholars Program.